For those of you who don't know us, we are Andrew and Gabriella Morrison. We designed and built the moveable tiny house known as hOMe and we work tirelessly to inspire others to reach their dream of a simple, joyous, tiny life. You can learn more about us and what we do on our website ( www.TinyHouseBuild.com). 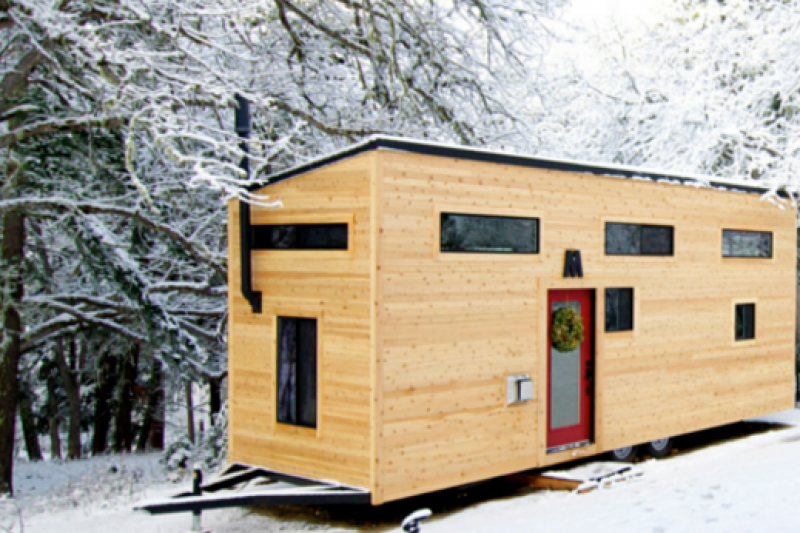 Andrew hired a seasoned mentor who had previous success with code language and approvals; and, together, they created a comprehensive code appendix that allows for the legal construction of tiny houses used as a primary residence in the United States. This is a BIG DEAL and will have a HUGE IMPACT on the construction of tiny houses all over the US. We won the necessary votes and we got the code appendix approved. It is officially part of the 2018 IRC! Check out this link for more information on the IRC process and to read the full code proposal. Having a tiny house appendix in the IRC code means more than you may imagine. It means that people who are strapped for money because of insanely high rents or mortgages could get out from under that weight. It means that people who have lost their homes and are living on the street could have a dignified place to live move into and get their lives back on track. It means that college students could afford housing to start themselves out on the right foot after graduation. And for all of us building tiny houses, it means that we finally have a guidepost to building safe and healthy homes with a certificate of occupancy at the end of that road. Simply healthy, safe housing that inspires people to live a life of joy, passion, and exploration. WHAT WE NEED & HOW CAN YOU HELP? 1. Helping to repay the fees for the assistance of Andrew’s seasoned Mentor. 2. Travel costs across the country as we continue to meet with code officials in different states in support of the code. 3. Andrew is NOT taking any professional fees from this campaign. Instead, it is soley used as outliend in #1 and #2 above. THE CODE HAS BEEN APPROVED! We won our votes both at the initial code hearing and during a subsequent, nationwide vote. We have a tiny house building code as a result. Now, we need each state to adopt that code, and that is where our work lies. YOU CAN HELP BE THE CHANGE! We are a large community of passionate people. Even a seemingly small donation of $10 or $20 multiplies fast, and can go a long way! WE CAN DO THIS! I hope that you will join us in supporting this powerful effort to make housing affordable in the US once again. We will forever be grateful, as will all of those who build their houses to the approved tiny house code appendix. Here's to hoping for success!!! Help spread the word! Share this campaign with your friends, family, and coworkers. This weekend was the one year anniversary of our time in Kansas City where we officially created a NATIONAL TINY HOUSE BUILDING CODE!!! We are still working on getting that code adopted in each state now that it is approved by the International Code Council. The Appendix, now known as Appendix Q, has been adopted in Idaho, and will be adopted in Oregon, New Mexico, Georgia, Maine, and Massachusetts very soon. Other states are also starting to get involved as well. Martin and I just completed the required Commentary for the Appendix. This document expands upon the work we did for the code language and explains WHY we wrote the code and HOW we came to our conclusions. It's been a long year of hard work, and we need your support. I am paying Martin for his professional services related to the creation of the code and all of our travel expenses around the US as we work to see the Appendix adopted have come out of our own pockets. Any help you can muster is so very appreciated. The building code will help us all. It is the path to LEGAL TINY HOMES in the United States and beyond. 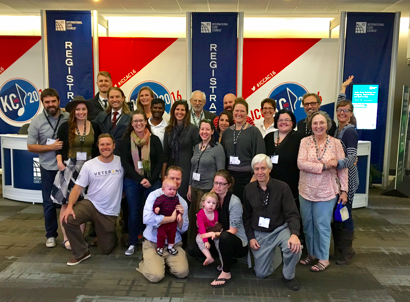 Please join those supporting our team: a group of regular people, dedicated to making tiny houses legal! Thank you in advance for your help. The National Tiny House Building Code!!! Hi everyone. Thank you so much for your continued support. You may have heard that the state of Idaho became the first state to fully adopt Appendix V! This is great news because, even though we won the approval of the ICC in December, we still need to win the state by state adoptions. And that is happening. Martin and I are still working on things in the background. We are traveling to different states (Massachusetts, Maine, New Mexico, etc.) to meet with the building code division members in hopes of gaining adoptions. 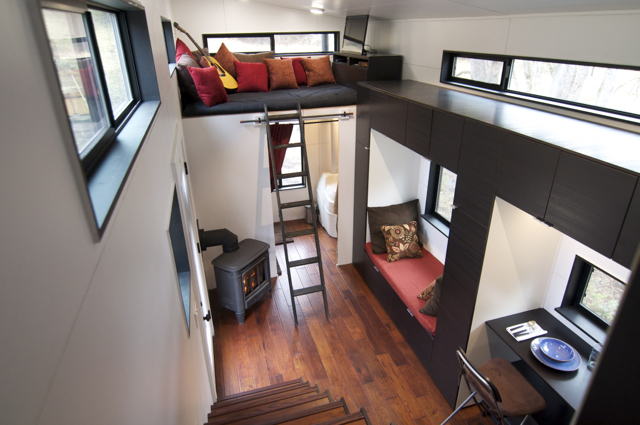 We are working on the moveable tiny house code language for 2021, and we are currently writing the required Code commentary for our Appendix. All this to say that we appreciate your continued support and financial help. If you know anyone who might benefit from our efforts and who would be interested in supporting our work, we would appreciate their help as well. I can't believe I didn't post an update here after our HUGE win in Kansas City. I was so busy posting it everywhere I could think of, I forgot this obvious page. Sorry. So rather than hashing out all of the awesomeness of our experience, I'll forward you to two blog posts. We literally could not have done this without you all. Thank you so much for your support and now (an advance thank you) for your help getting this baby passed!!! We did it! We reached our goal to fund our speakers heading to Kansas City is support of the tiny house code change proposal. Thanks to everyone who helped. If you know a building official who supports tiny houses, please ask them to draft a letter supporting our public comment on RB168-16 and email me a copy or tag it here. Thanks!!!! As a homeless disabled vet tiny house living is key to enjoying life. Living on very tight budget, I understand the need for this bill to be passed. Being a nature enthusiasts, I see the true potential in whst this bill will do both for recreation of lands, wildlife and welfare of so many who share my ever more common situation. I have drawn up my plans for the tiny house of my dreams, but without this bill it will be impossible to build that dream. Passing of this bill allows for cheaper construction cost, better quality of homes, better quality of life for myself and millions like me. Thank you for sharing this dream..... Lcpl Epperson, u.s.m.c. Hi Kathy Sutton. Just wanted to let you know that if this proposal is approved, it would be implemented across the US in any jurisdiction that uses the IRC. That is the model code for most residential housing in the United States. According to the ICC website "The International Residential Code (IRC) is in use or adopted in 49 states, the District of Columbia, Guam, Puerto Rico and the U.S. Virgin Islands." i will only danate if this is my state. which is wisconsin. thanx for your work there. bless you. Hello! This is amazing! My goal is live with my 3 kids in a tiny home! We are currently homeless (staying with my sister until a place comes up) and i even started a gofundme to help us get a place! My goal would be a tiny house or a small starter home! Tiny homes are the new and only way to go! I also have a gofundme upfor a young woman who has struggled with a black cloud. She tries her best to raise her two boys without help from their dad. She works but she lives in a place where most work is seasonal. She never has enough to pay for an apt. for her and boys. The boys have NEVER had a room to call their own, ages 12 & 9. She has lived withher sister, back at her moms, friends, etc. I am building a tiny house/barn, only 20 x 12. I put in 1,000. of my own money toward supplies. I went to job sites and asked for wood from workers. I got 2 x 4's with nails or mistakes but it helps. I have almost enough to finish building but have no money for wiring, a bathroom, etc. It is just the structure. I also have partial leftover drywall to piece and part, and roofing tiles. I wish you could come help us build this for her. I am 56, a woman and have done this project all by myself, noone has helped. I even sent letters to construction crews and asked if they would donate a few hours. No one came. I see a lot of questions, but to me it is a no-brainer. I believe that all people who want to live tiny, anywhere in the world should support this in any way they can, not just for a particular state because it is obviously a matter of time and as different states adopt anything, others will follow suite. I supported you before and will be very happy to do it again. Want to say, IM happy for you. At this very moment I was choosing which site to use. I've had a big hardship and a tiny house is perfect. I've seen this very one. Amazing. Come to Oklahoma, maybe I'll have raised enough. What exactly is this for? I really want to donate but I want to know what it's all about. Hi Ruth. I feel the same way! I have only been able to share the update from "inside" the campaign. It then goes automatically to my facebook page and I then share it from there. You can share it from my page or from the TinyHouseBuild.com facebook page if you can't find my personal page. Thanks for asking! I'm not usually incompetent with technology, but I have not been able to share the memes. When I click to share, a post goes up with the original photo from the campaign. When I clicked save on the photo, it took me directly to Pinterest. Can anyone give me instructions to post the memes to Facebook? Thanks. Check Frontier Airlines for good deals to KC. I recently flew from ATL to KC for $40 round trip. They run specials all the time. It pays to join their Den Club. Membership is $48/year and you can find some excellent deals. I saw your tiny the week you posted it online. It is so attractive and well-planned! Thanks for all the sleepless nights and long days you've all put in to advance the safety and acceptability by fighting for, and achieving the goal for all of us. It's still a long haul. Mahalo! Thank you for all you do. I'm looking forward to changes in York PA.
We like small footprints and time to travel. We have two tiny homes on a lot and are seeking approval in our community to help others learn to build and create a lifestyle of change. Thank you for everything you guys are doing and have already done. This is a meaningful solution to a growing problem. I want to help reverse the trend. Great work, Andrew and Gabriella. How else can I suupport this legislation? Who to contact? Thank you!